The sight of the MAF Europe seaplane hovering above the char steals everyone's attention on the island. As the plane descends on the river children run to the banks to view the strange flying boat. Some of the older children even swim across to the other side of the river to help Marco Koffman, the pilot, to 'park' the seaplane after the passengers get off. The passengers get on a speedboat to go across the river. 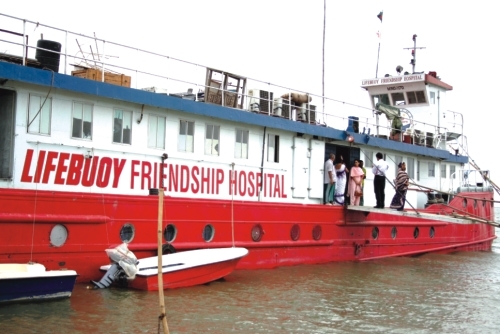 It is their turn to be awestruck now, when the sight of the floating hospital greets them. What is even more striking is the crowd of men, women and children waiting for their turn to see the doctor. An area of the island is filled with makeshift tents where the patients are camping for days, getting treated or just recuperating after an operation.